It is astonishing how much has been written about Sacagawea given the paucity of hard information on her. There are few documentary sources apart from the Lewis and Clark journals, and even the derivation and spelling of her name is at issue. Should it be Sacajawea, supposedly a Shoshone word meaning “Boat -Launcher.” or should it be Sacagawea, a Hidatsa word for “Bird Woman”–the commonly accepted version today- Since attempts at spelling her name in the journals indicate that the third consonant was hard, it has also been rendered Sakakawea, the preferred spelling in North Dakota, just as Sacajawea has been favored in Wyoming, where the legend persists that she lived to a ripe old age, dying on the Wind River Shoshone Reservation in 1884 a few years short of a hundred. 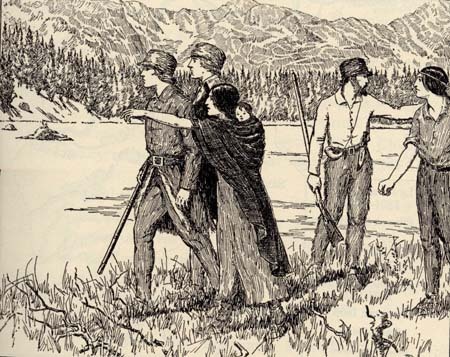 This was the romantically-appealing but historically-suspect position taken by Wyoming historian Grace Raymond Hebard in her influential 1932 biography Sacajawea–a position uniformly rejected by modern authorities, who agree that Sacagawea, the Bird Woman, died in her mid-twenties in December 1812, six years after the Lewis and Clark Expedition returned home. This much is certain, then. Sacagawea, a young Indian mother and her infant boy accompanied “a party of men” on an arduous journey across the continent to the Pacific Ocean and back again. In and of itself this was accomplishment enough to secure her place in history. But over time Sacagawea became something more than a brave and resourceful woman who shared all the hardships of the trek. She became an American icon. Such was not always the case. No picture exists of Sacagawea, and none appeared in the school readers published before 1900–hardly a surprise, considering the short shrift usually given the Lewis and Clark Expedition in nineteenth-century histories. It merited less than a single paragraph in John Clark Ridpath’s 691-page Popular History of the United States of America (1878). 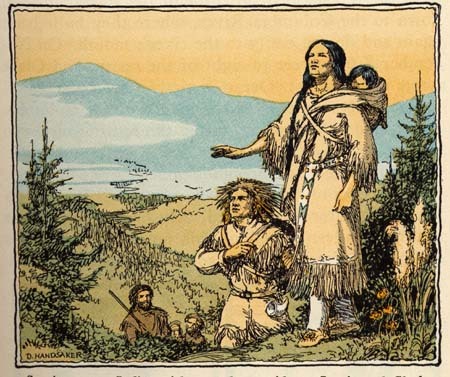 As the centennial of the expedition approached, however, interest stirred and Sacagawea emerged as an equal partner in discovery, an inspiration for women everywhere–and, eventually, as the third member of what became the unmistakable triumvirate of Lewis, Clark and Sacagawea, infant strapped on her back, as she literally pointed the way west for the explorers. Sacagawea had stepped from the periphery to become, by popular reckoning, a key actor in the drama of discovery. Today she actually identifies the celebrated duo of Lewis and Clark, who have been pictured as Minute Men clones in tri-cornered hats and as Dan’1 Boone look-alikes in frontier buckskins, according to the artist’s preference, but are unmistakably Lewis and Clark when Sacagawea is included. 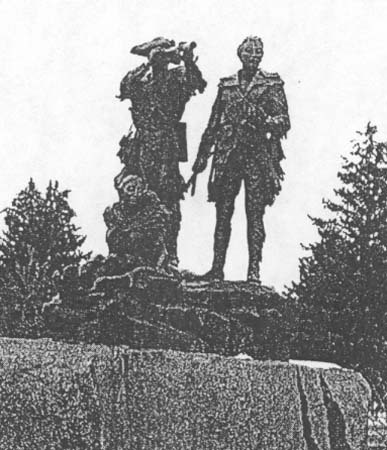 Fig 2: Daubs’ monumental sculpture combines a standing Lewis, a seated Clark and a kneeling Sacagawea facing one way, York and Seaman the other. 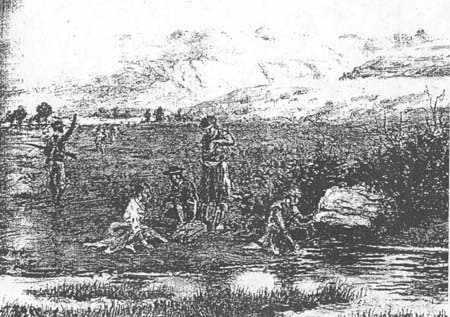 Sacagawea’s reputation as the expedition’s indispensable guide turns on William Clark’s journal entries in 1806 when Charbonneau and his wife and baby accompanied Clark’s party on the return journey. On July 6 Clark noted that in the valley of the Big Hole River, “the Squar pointed to the gap [in the mountains to the east] through which she said we must pass . . . She said we would pass the river before we reached the gap.” And on the 13th he added that she had been “of great Service to me as a pilot through this Country.” Drawing on Clark’s characterization, Sacagawea has been transformed into the “woman pilot” who steered Lewis and Clark to the Pacific and then back home again. The transformation began in 1902 with Eva Emery Dye’s thinly fictionalized novel The Conquest: The True Story of Lewis and Clark. In a chapter titled “A Woman Pilot” Sacagawea points out familiar landmarks to the explorers and is described as “a Princess come home to her Mountain Kingdom.” The woman pilot image was irresistible, and Dye challenged artists to give it visual form:. Sacajawea, modest princess of the Shoshones, heroine of the great expedition, stood with her babe in arms and smiled . . . So had she stood in the Rocky Mountains pointing out the gates. So had she followed the great rivers, navigating the continent. Sacajawea’s hair was neatly braided, her nose was fine and straight, and her skin pure copper like the statue in some old Florentine gallery. Madonna of her race, she had led the way to a new time. To the hands of this girl, not yet eighteen, had been intrusted the key that unlocked the road to Asia. Some day upon the Bozeman Pass, Sacajawea’s statue will stand beside that of Clark. Some day, where the rivers part, her laurels will vie with those of Lewis. The white men said, “She goes like a bird. Her finger lifted toward the sea! It is possible that other artists anticipated Cooper’s finger-pointing Sacagawea. A print identified as the work of nineteenth-century illustrator Alfred Russell shows a blanket-wrapped Sacagawea, her baby riding in a cradle-board on her back, pointing off’ in the distance. But Russell’s Sacagawea, turning her conventionally pretty face towards the two captains and smiling winsomely, looks suspiciously like the other Indian princesses who were a staple of early twentieth-century advertising and calendar art. 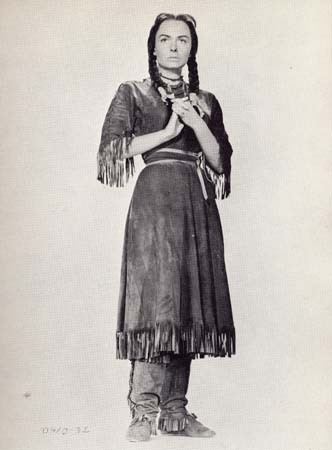 The Indian princess is a Miss America in the making, and Sacagawea retained her “perfect caucasian features” whether played by an established star in a Hollywood movie or by a beauty queen in a local historical pageant. Donna Reed, herself a former beauty queen to whom the word “wholesome” stuck like glue during her career as a leading lady in the 1940s and ’50s, starred as Sacagawea in The Far Horizons (1955). Publicity stills show her posed in her buckskin costume more vamp than madonna, and firmly within the Indian princess tradition. 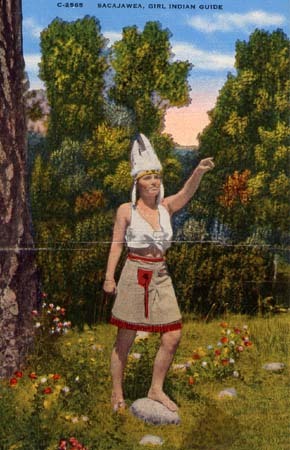 A postcard made in 1945 shows a pretty young white woman in a feather headdress impersonating Sacajawea, Girl Indian Guide. It is as much a tribute to Cooper’s statue unveiled forty years before as it is to the historical Sacagawea. It clearly demonstrates how the Portland monument had set the standard in Sacagawea imagery, literally pointing the way for later artists. 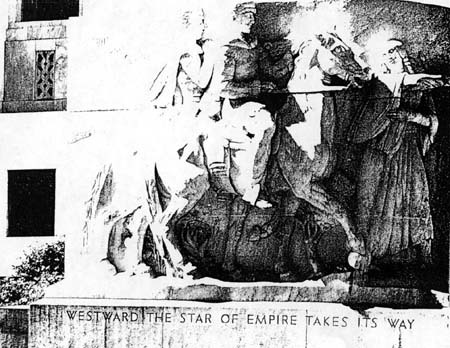 Montana’s peerless “Cowboy Artist,” for one, incorporated a pointing Sacagawea in his 1917 watercolor design for a monument, Lewis and Clark and Sacajawea. The original plan called for two monuments, “one to be placed at the City of Great Falls, the other at the confluence of the three rivers forming the Missouri, the design of both to be alike.” Great Falls objected: it wanted a monument all its own. Perhaps this disagreement was enough to derail plans. At any rate, Russell’s design would not be rendered into sculptural form until 1929, three years after his death, and the artist chosen would be not Paul Fjelde but Henry Lion, a young Los Angeles sculptor hand-picked by Russell’s widow. 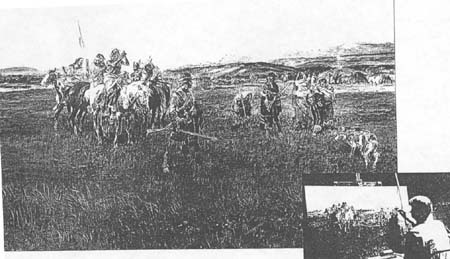 The net effect was that the intended monument was never erected in Great Falls, and Lion’s sculpture, intended for placement in Fort Benton instead, was not cast until years later. 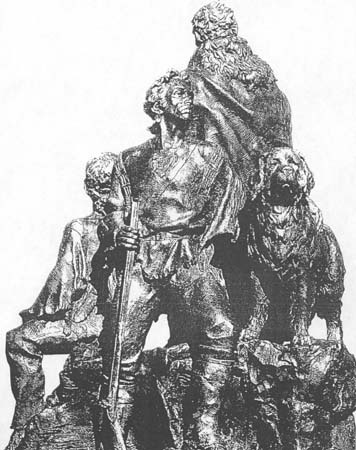 Eventually a monument to Lewis and Clark loosely based on Russell’s design would be sculpted by Robert Scriver and erected in Fort Benton, at the head of navigation on the Missouri, in 1976. 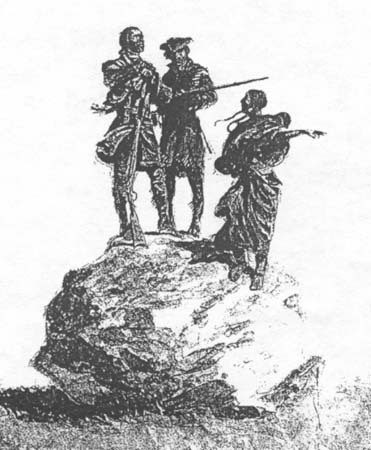 Called Explorers at the Marias, Scriver’s group shows Sacagawea seated at the feet of Lewis and Clark, gazing into the distance as they attempt to determine the true source of the Missouri at a fork in the river. Interestingly, she no longer points the way west. After Cooper, the pointing Sacagawea had become something of a cliche. 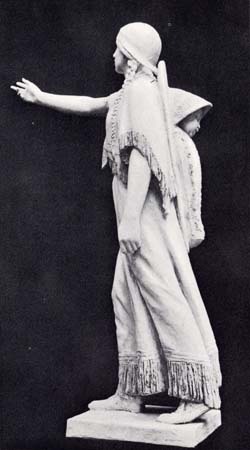 Inspired by Russell’s design, his Great Falls neighbor Jessie Lincoln Mitchell modeled Sacagawea in a fringed dress, baby peering over her shoulder, right hand pointing. Mitchell intended her figure to stand at the Gates of the Mountains, near Helena. She took her working model to Russell for criticism. 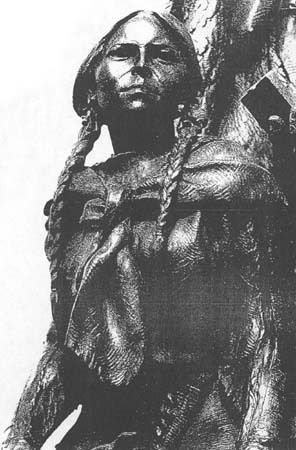 If a Mandan or Shoshone woman “was ever caught with her buckskin skirt up to her knees and her dress off her shoulders like this,” he told her, “the old chief wouldn’t look around for a white man to scalp!” He made other costume suggestions, and Mitchell incorporated them in her final design, noting that “my model of Sacajawea was to that extent guided by Russell.” Cyrus Dallin, renowned in his day as a sculptor of Indian men–his equestrian statue Appeal to the Great Spirit (1909) remains probably his best known work–created a model of Sacajawea in 1914 showing her stepping forward, left arm at her side, right arm extended, pointing. 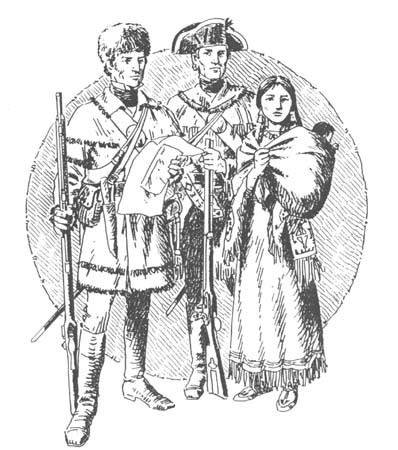 School history texts in the twentieth century routinely featured Lewis and Clark illustrations showing Sacagawea as guide; one can serve for the many: The Bird Woman Showing Lewis and Clark the Way illustrated Thomas M. Marshall’s American History (1935), and serves as a direct tribute to Cooper’s enduring influence. The pointing figure of Sacagawea has become so familiar that it seems almost inevitable. Could she have been shown any other way? In fact, it took time for Sacagawea to be enshrined as the expedition’s guide in Lewis and Clark imagery. In many paintings from the early 1900s she was a passive witness to events rather than an active participant in them. 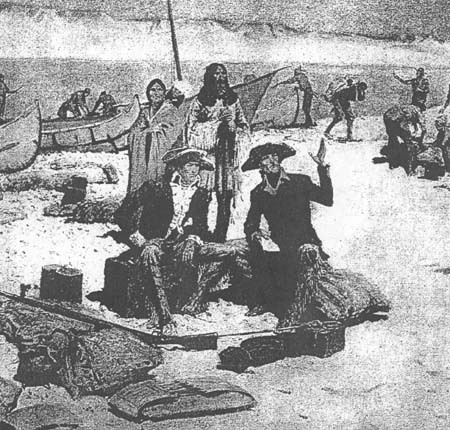 In Lewis and Clark, one in a series of ten paintings on the theme “Great Explorers” published in Collier’s Weekly in 1905-06, Frederic Remington, who rarely included women in his work, showed Sacagawea standing behind her husband, Charbonneau, looking on as Lewis and Clark, seated in the foreground, map out their strategy. 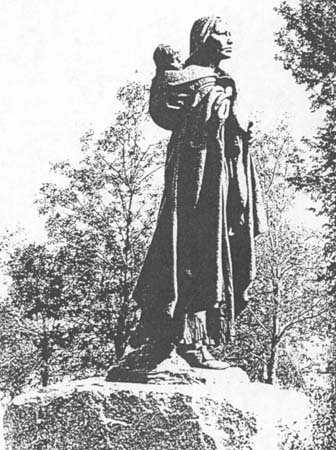 His portrayal of Sacagawea resembles a sculpture by Bruno Lewis Zimm exhibited at the St. Louis World’s Fair (officially, the Louisiana Purchase International Exposition) in 1904, where one of Remington’s celebrated cowboy groups was also on display. Zimm showed his Sacagawea with a walking stick–a convention that was adopted by Edgar S. Paxson, a Montana painter, in standing portraits of Sacagawea painted in 1904 and 1914. 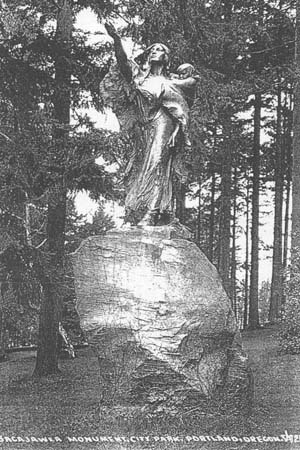 It is noteworthy that the earlier of the two portraits showed Sacagawea leaning on her stick gazing off in the distance, while that done in 1914, after Cooper’s Portland monument had attracted considerable attention, shows her pointing with her left hand. Old conventions died hard. But another impressive early monument, Leonard Crunelle’s Sakakawea, provided an alternative to Alice Cooper’s conception. Unveiled in 1910 on the North Dakota State Capitol Grounds in Bismarck, it marked the beginning point of Sacagawea’s journey, as the Portland monument marked its western end. Relying on a portrait of Mink Woman, a Hidatsa, Crunelle created a standing figure, chin raised, eyes fixed on distant prospects, her baby boy gazing over her shoulder, mirroring his mother’s gaze. 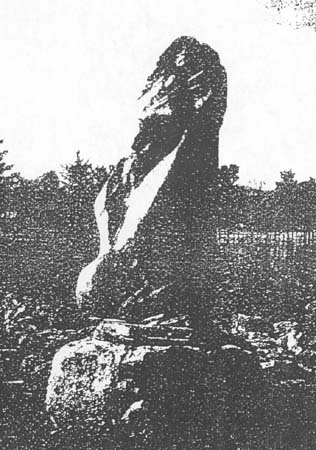 Though never as influential as Cooper’s statue, Crunelle’s Sakakawea shared the same motivation (both were commissioned by local Women’s Clubs to honor a woman’s achievements) and left its own imprint on later depictions. 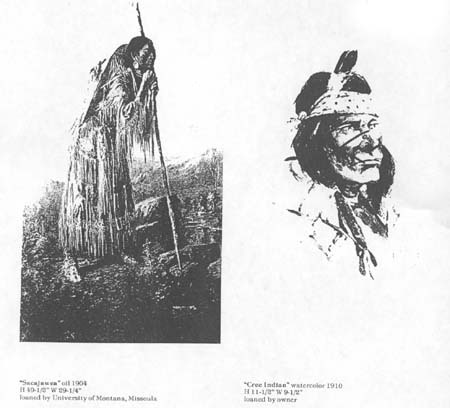 D. Handsaker s textbook illustration of 1932, Sacaiawea, an Indian Girl, is a case in point. An interesting variation in Sacagawea imagery was introduced in 1905 with Henry Altman’s equestrian portrait. Other artists have followed suit, but a mounted Sacagawea has never had the obvious appeal of a standing Sacagawea pointing off in the distance. Recent artists have mostly avoided the finger-pointing cliche, though it was revived in two of the original designs for the Sacagawea “gold dollar” first minted in 2000, and in a 1991 sculpture by John M. Soderberg, Birdwoman. A new trend in Sacagawea imagery–including the likeness on the dollar coin–recognizes that she was still in her teens when she accompanied Lewis and Clark. Michael Haynes’ standing portrait Sacagawea shows her as round faced and small, a girl/woman who was herself a mother, and a historian has recently dampened the celebratory tone of Sacagawea imagery by pointing out that she was never in control of her own destiny. She accompanied the expedition as a hostage to the decisions of others, Albert Furtwangler writes, not as an independent actor. But Sacagawea has long since transcended such historical realism. She continues to be the glamorous Indian princess in paintings faithful to the conventions of historical romance–her blanket flies out behind her in the cover art for Anna Lee Waldo’s best-selling novel Sacajawea (1979), an image indebted to N. C. Wyeth’s famous 1909 painting Winter (Wyeth also painted a pointing Sacagawea in 1939). If too many sentimental pictures of her festooned in feathers, at once demure and seductive, or stroking a horse’s muzzle, all tender love, begin to cloy, there is a potent antidote in Harry Jackson’s monumental 1980 sculpture Sacajawea at the Buffalo Bill Historical Center in Cody, Wyoming. Jackson portrays her as an American madonna, her blanket billowing, her hair streaming in the wind, rooted in her native soil, Powerful and permanent, she is no hand-maiden to white ambition; she is the earth itself. May 14 1805: When the captains’ pirogue (with her husband at the helm) nearly capsized, Sacagawea who was in the rear had the presence of mind to catch “the articles which floated out”–thus helping avert any loss in what would have been a disaster had the pirogue sunk, since it contained, as Clark noted, “our papers, Instruments, books, medicine, a great proportion of our merchandise, and in short almost every article indispensably necessary to . . . insure the success of the enterprise in which, we are now launched to the distance of 2,200 miles.” Artist John Severin captured the moment in a pen and ink sketch published in 1968. 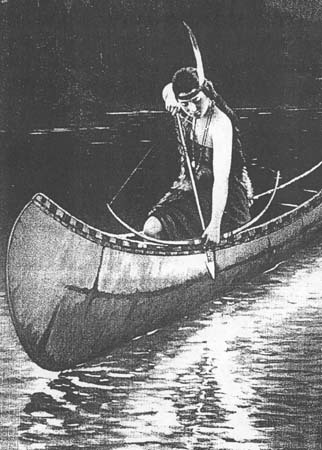 June 13-18 1805: It looked for awhile as though Sacagawea would die en route to the Pacific. She took ill on June 13 and Clark, who deemed her condition “Somewhat dangerous,” on the 15th applied a poultice to her lower abdomen (pelvic area), which gave her temporary relief, though she refused all medicine and continued to sink. Lewis on the 16th determined to try the waters of a sulphur spring located a couple of hundred yards from the Missouri’s north bank (known to this day as Sacagawea Springs) and. in conjunction with a mixture of barks and opium, produced such a rapid turn around that she was pronounced cured by the 18th: “The Indian woman is recovering fast,” Lewis wrote. “She set up the greater part of the day and walked out for the fist time since she arrived here; she eats heartily and is free from fever or pain.” Olaf C. Seltzer made a miniature oil painting in the 1930s titled Sacajawea at the Sulphur Spring (June 16, 1805). 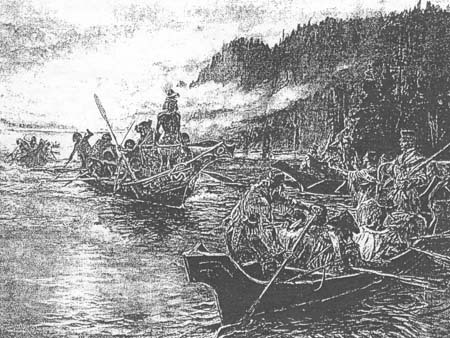 January 6 1806: After the Corps of Discovery was settled in its winter quarters at Fort Clatsop in present-day Oregon, Clark set out on the seven mile trek by water and foot to the ocean. He had heard of a beached whale and was determined to acquire a supply of whale oil and blubber. Sacagawea had pleaded to go along, Clark noted, and he granted her wish. “She observed that She had traveled a long way with us to See the great waters, and that now that monstrous fish was also to be Seen, She thought it very hard that She Could not be permitted to See either (She had never yet been to the Ocean).” Though artists have shown Sacagawea wading in the surf like a summer tourist at what today is the resort town of Cannon Beach, the January excursion was no picnic. The wind was blowing hard when Clark’s party reached the ocean on the 8th, and the sea, he said, was “breaking with great force against the Scattering rocks at Some distance from Shore, and the rugged rocky points under which we were obliged to pass.” One false step and they would have been “dashed against the rocks in an instant, fortunately we passed over 3 of those dismal points and arrived on a beautiful Sand Shore on which we Continued for 2 miles, Crossed a Creek 80 yards near 5 Cabins, and proceeded to the place the whale had perished, found only the Skeleton of this monster on the Sand between 2 of the villages of the Kil a mox nation.” The whale, which “lay on the Strand where the waves and tide had driven up & left it,” was “already pillaged of every valuable part,” and the Tillamooks were “busily engaged boiling the blubber.” But the skeleton, measured at 105 feet in length, was impressive, and Sacagawea’s insistence on seeing it and the ocean for herself has cemented her reputation as something much more than a “tag-along” on the Lewis and Clark Expedition. Artist John Clymer paid tribute to her initiative in a 1974 oil painting that captured the Gold Medal in its category at the National Academy of Western Art Show that year, Sacajawea at the Big Water. A Washington native with a strong background in Northwest Coast themes, Clymer enjoyed a long, successful career as a commercial illustrator and, beginning in 1942, a Saturday Evening Post cover artist. In the early 1960s he began a second career when he turned to historical Western art. 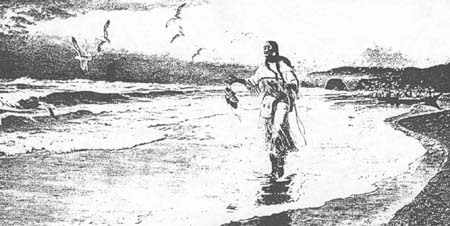 With a special affinity for mountain men subjects, he reached back in time to paint this arresting image of Sacagawea, moccasins in hand, cradleboard on back, wading in the Pacific surf. “This must have been a great experience in her life and one of the wonders of the journey,” Clymer’s biographer observed. Though the convention of Sacagawea pointing the way as guide has dominated Sacagawea imagery, Charles M. Russell offered a fanciful but beautifully-painted tribute to her primary role as interpreter in a 1905 watercolor, Lewis and Clark on the Lower Columbia. With a deep interest in Montana Indian cultures and a facility at sign language himself, Russell often portrayed parties of Indians in which one member communicates with the others in sign to avoid breaking the silence in hostile country. 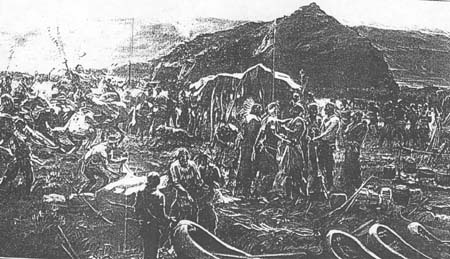 Here he depicts Sacagawea translating to a party of Northwest Coast Indians in war canoes at the mouth of the Columbia River. To add pictorial interest, he shows her standing and gesturing in sign language, thus reinforcing her spoken words. 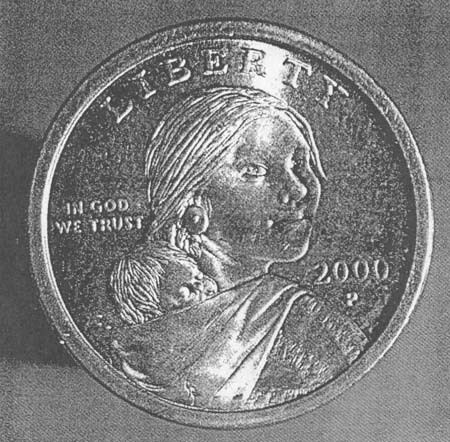 and it is now indelibly stamped along with that of her baby on the wildly popular Sacagawea “gold dollar” which (perhaps fittingly, given her role as speaker at the Portland monument dedication in 1905) replaced the Susan B. Anthony dollar coin in 2000. As the bicentennial of the Lewis and Clark Expedition approaches, Sacagawea imagery is already pouring forth. Unconstrained by fact, artists are free to interpret her as they will. Attempts at historical realism may vie with variations on the tried-and-true stereotypes–beautiful princess, native Madonna, indispensable guide. But realism is bound to lose out in the end. Fact has never trumped romance in Sacagawea imagery because the legend of Sacagawea has an emotional appeal mere fact can never equal. 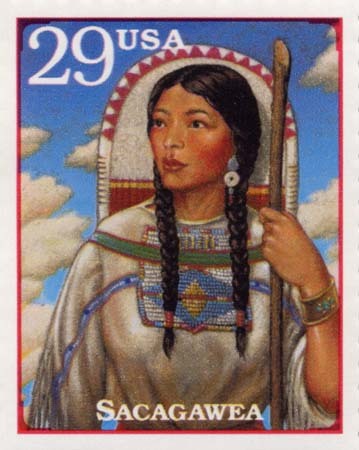 Sacagawea is today the most honored woman in American history. Her name adorns troop ships, parks, schools and landmarks galore. Any artist who would successfully portray her must come to grips with her legend. 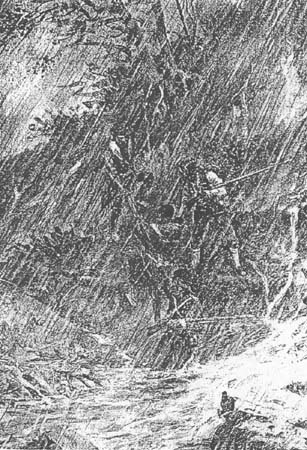 “There were many heroes, there was but one heroine in this band of immortals,” a writer asserted at the time of the Lewis and Clark centennial in 1904. “All honor to her!” One hundred years later Sacagawea is literally coin of the realm part of the common currency of what it means to be an American.